Our walks are rated from Grade 1 to Grade 5 as prescribed by the Australian Walking Track Grading System . 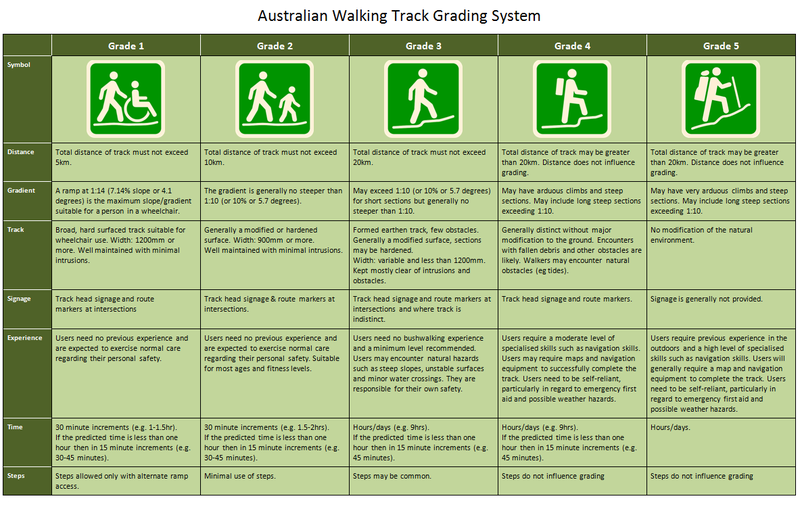 This grading system uses multiple objective criteria to assess the difficulty of a walking track. The Track Grading Matrix below lists the criteria and the levels of difficulty associated with each grading level. The overall grade of a walking track is determined by the greatest level of difficulty across all of the criteria. Track Grading Matrix. Click on the matrix to see it displayed at full size then use the back button to return to this page. Grade 1 – This walk is suitable for the disabled with assistance. Grade 2 – This walk is suitable for families with young children. Grade 3 – This walk is generally recommended for people with some bushwalking experience. Grade 4 – This walk is generally recommended for experienced bushwalkers. Grade 5 – This walk is generally recommended for very experienced bushwalkers. Members can download the WBOC Track Grading Calculator from the Members Only area to assist them in grading a walk.